The Brookfield Chamber of Commerce serves as a united voice for the business people of our community. Our purpose is to link local businesses to each other, to town residents and to visitors thereby providing growth opportunities to all who participate. 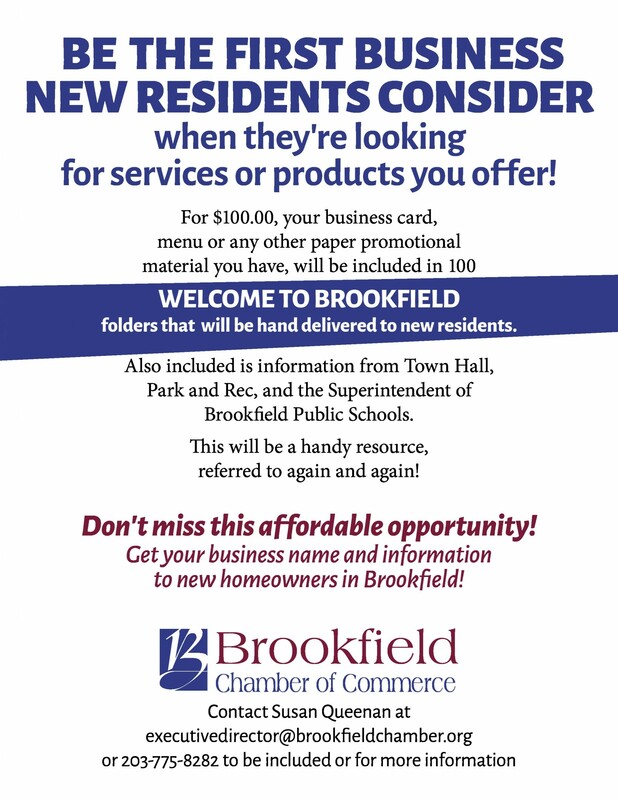 Each member of the Brookfield Chamber is included in at least one category in the printed and online directory. Up to three listings are available at no-charge with your membership. What comes with a Chamber Membership? The Brookfield Chamber of Commerce serves as a united voice for the business people of our community. Our purpose is to link local businesses to each other, town residents and visitors thereby providing growth opportunities to all who participate. Build business alliances through networking. Provide input into the direction of economic growth for the Town of Bookfield. Facilitate educational forums and workshops on topics of interest to the business community. Promote trade events showcasing the talents of Chamber members. Identity opportunities for local businesses to contribute time, material and expertise to the community. Each member of the Brookfield Chamber is included in at least one category in the printed and online directory. Up to three listings are available in the online directory at no-charge with your membership.